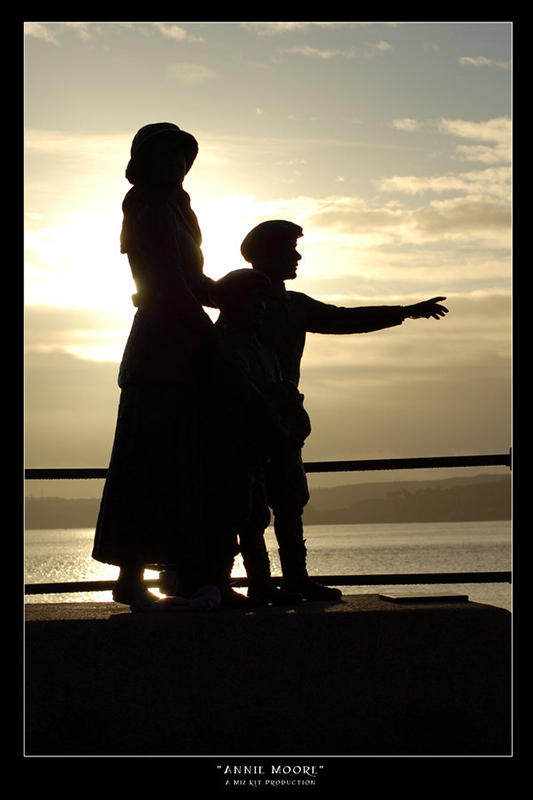 This statue of Annie Moore and her brothers Phillip and Anthony look west at Cobh Harbour, from whence so many Irish left for America. Annie was the first immigrant processed at the newly opened Ellis Island on January 1, 1892, the same facility my own grandfather passed through almost thirty-five years later. There’s a statue of Annie Moore at Ellis Island, too, looking eastward toward Ireland. I’d love to get a picture of that statue, too, but it wouldn’t be as spectacular as this one, by simple dint of being indoors and therefore impossible to silhouette like this. Quite. And knowing the story makes it all the more powerful. OMG that's gorgeous, Kit--and so, so resonance-y. I was surprised to learn this was a statue and not living, breathing people. But they WERE living, breathing people, so I guess it's fitting to bring them to life once more. Well done! oh cool. I hope it's open too. I've been there once, though I didn't find my grandfather's name. It's a good place to visit.